Earlier vacation episodes, we were in Capetown, on a safari, and in Zanzibar. At the time we were planning our trip one of my best friends was living in Addis Ababa, Ethiopia. Even though it's not that close to where we were, we couldn't imagine going all the way to Africa and not visiting. So out last leg of the trip was a quick stopover in Addis before heading home. Ironically, my friend had to go back to the States the week we were there, so we ended up with a relatively unplanned weekend in a new city. At least she hooked us up with her driver and made some arrangements for us, including a trip to see thousand year old stone churches in Lalibela, a day at the spa and some wonderful eating recommendations. Let me just tell you, for someone not used to developing countries (me!) Addis was crazy. Donkeys carrying merchandise along the roads have to weave in and out of the construction happening everywhere. Our nice and brand new hotel overlooked clusters of homes that were not much more than tin and cinder block. Intersection with no street lights or signs were full of cars resembling models from the 80's. I thought I knew what traffic was coming from DC, but so many cars on curvy roads and roundabouts without any apparent order took "traffic" to a whole new level. It made me so grateful Lisa recommended we use her driver. He navigated the streets with ease, plus was so extremely kind and knowledgeable about the city. We visited what I think was the first ever coffee company, Tomoca. 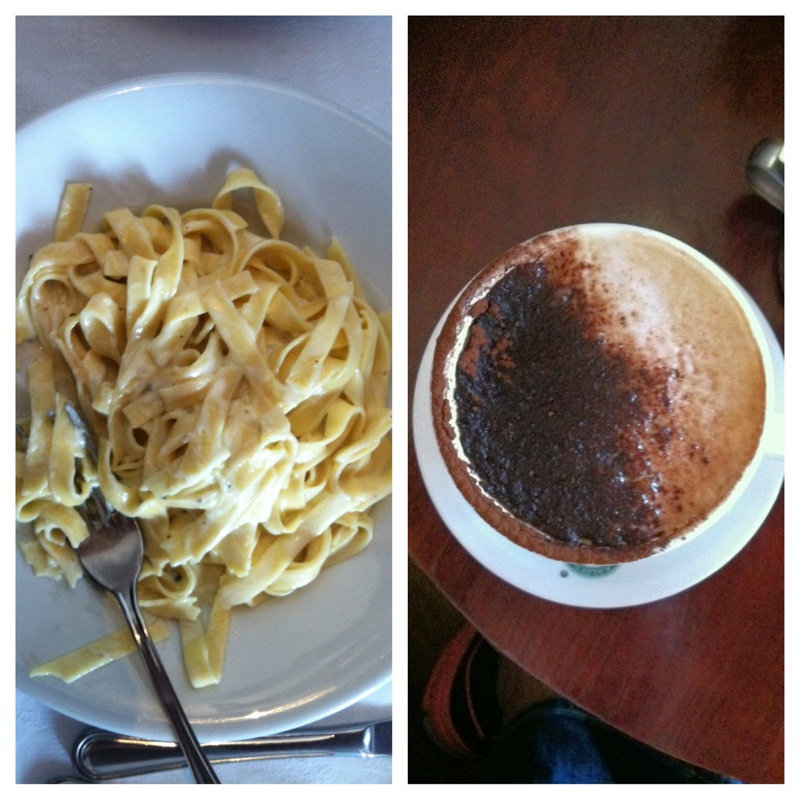 I learned that some of the lasting results of the country being occupied by Italy were delicious espresso and Italian food. Naturally, we partook of both every chance we got. We completed our day by picking up a few souvenirs at Africa's largest open air market, known as "the Mercado." One of the books I brought with me on the trip was a historical fiction set in Ethiopia which made the trip extra fun for me to feel like a local expert. "Want to get a local beer? St. George's! It's in my book," or "Of course I've heard of the political figure that statue is of. They talk about him in my book." The last excursion before finally heading home was a day in Lalibela. It is the site of ancient churches carved down into the stone over a thousand years ago. If you are into old stuff, architecture or religious sites or you are my husband, this is your kind of place. Our initial arrival involved a bit of confusion about our hotel and a long ride on bumpy roads going up a mountain, weaving in between people and animals in their way to the market. We ended up staying at Top Twelve Hotel, though our initial choice before the mix up, Cliff Edge Hotel seemed just as nice. The owner was very nice, and for what we considered a cheap price, we got a huge room overlooking the valley below. Our tour guide was a local we met at the airport, trying to get his tour business off the ground independent of the hotels and travel agencies who seem to have a bit of a monopoly. Taye was friendly and informative and really knew the local area. He took us to the Seven Olives restaurant which had a nice view and huge salads. We happened to be there on a local holiday, St. George's Day, which meant we got to watch a very colorful and traditional parade. There were boys singing songs, women with umbrellas and priests with all the ceremonial garb. This was one of the highlights for me as it felt like one of the most uniquely authentic experiences we had. The churches themselves were quite amazing. They were literally carved right into the rock so the building and surrounding rocks were one continuous piece of stone. After touring the churches we enjoyed the most stunning sunset view of the trip off of our balcony while playing around with the camera. Almost done. We were pretty ready to be home, but not before a flight back to Addis, a day at the spa (take advantage of those exchange rates! ), a lot of espresso and then the flight home through Amsterdam, bus from the airport to the metro and finally home. Jason requested a direct flight the next time around. Not that a "next time" is too likely, since this was definitely a once in a lifetime kind of thing. So that was our trip. We're so glad God provided for us to go see a totally different part of the world without any major disasters. We were also pretty grateful that our car was still where we left it with all the windows in tact (a legit concern in our neighborhood). Now that it's over we've been mulling over what we saw, experienced, and what ways we may be called to meet some of the massive need in that part of the world. It was a good reminder of how blessed we are in America despite the flaws that can be easy to politicize and focus on. I love America! I like to prove it after long trips by eating at Chipotle to celebrate. If you missed the first two rounds, part one is about Capetown, and part two is about our safari at Mala Mala. Since our safari was cut short we had an extra day in Johannesburg to bop around. (Side story: We tried to get on an earlier flight to Zanzibar, but it didn’t work out. The frustrating part about trying to make these arrangements was that no one at the Kenya Airlines service desk was answering the phones. Their customer service line was only open Monday through Friday and no one ever answered the main phone at the airport. With the little internet connection we had, we frantically emailed my father, the hero, to call the US support number. I know my dad is so busy and calling any service number takes so long. He was able to get some help, but the only other option involved a 12 hour layover. Needless to say, we really appreciated it even though we didn’t end up switching our flight.) After leaving the rental car, Mala Mala had arranged for a driver to bring us and a few other stranded people back to Johannesburg, or Jo’burg as they say. As someone who likes to have a plan when we visit someplace, usually with a plan B and C as well as all our meal and snack options figured out, a day with nothing researched was a little unusual to me. (By “unusual” I mean something that normally makes me panic.) Thankfully, some local filmmakers evacuating Mala Mala were on the ride with us and gave us some ideas on what to do in the city, as well as what part of the city to avoid. I gotta be honest… most of what I’d heard about Jo’burg involved carjackings and muggings that leave you dead, so it was not my city of choice to spend an extra day in, but after hearing enough from the locals and reminding myself (er.. Jason reminding me) that we live in one of the higher crime areas of DC no problem, I was ready for an adventure. After a restful night at the Premier Hotel we took the free shuttle to the train station. The gautrain, as it is called, was apparently built for the world cup. South Africans told us it was pronounced with an “H” sound, like “hout train”, so we had a lot of fun pretending we had local accents while pronouncing it. We stuck to the tourist areas in Sandton and Rosebank where I think all we did was eat, take goofy pictures, and explore the wine selection of the local grocery stores. Because we didn’t really know what else to do, we saw a movie called “Searching for Sugarman.” It is a documentary partially set in South Africa, which made it extra fun to see there. And if you ever go, take a peek into a boutique called The Space, because, you know, the exchange rate is so good, and you definitely need that dress. Hashtag, no filter. The water was just that blue. We stayed on the north part of the island in a town called Nwungi at the Langi Langi Beach Bungalows. The hotel itself was in a great location with the restaurant and sun deck right on the water. The rooms were pretty sparse and simple, but the grounds were nice with a pool and good beach access. Plus, it was one of the cheaper places in the area. From what I could tell, it was a good part of the island to be at, with tons of other restaurants, hotels and water sport shops in easy walking distance. We usually ate at our hotel because it was reputed to have some of the best food around, and I am still a paranoid traveler who didn’t like to be too far away from our hotel at night. Because it wasn’t a resort with a private beach, locals merchants usually tried to sell their wares as soon as you set foot on the beach. They were friendly, but it wasn’t like the US in that respect. We did our dive with Zanzibar Watersports, which turned out to be the building right next to our hotel. The guides were really friendly and knowledgeable, and diving at the Mnemba Atoll itself was by far the best dive we’ve ever done in terms of the colorful wildlife. Our highlights were seeing a sea turtle, blue spotted stingray, lionfish, and a few fish that had me wishing I had paid more attention to the National Geographic videos my sister watched weekly as kids. On many parts of this trip it felt like to really “experience” the area, you have to be on the go: looking at something, walking somewhere, cramming in as much as possible. I love how at the beach though, just sitting around and soaking in the view is experiencing where you are to the max. Man, and this place was beautiful. We dove through schools of colorful fish in warm, clear water the color of seaglass. We watched amazing sunsets from the hotel deck, glass of wine in hand. We ate the same fish for dinner that we saw local fishermen catch that morning. Jason and I repeatedly said to each other, usually with said glass of wine in hand, “We have amazing lives.” It’s actually something we say often to each other both as a way to just enjoy the moment and to remind ourselves not to take for granted the undeserved blessings God gives us. We do our best when traveling to get a finger on what the pulse of the city is really like. We wandered a bit one afternoon into the area away from the hotels where we bought cokes and fabrics from local shop vendors. It was an odd contrast to walk from the beautiful beach to dusty roads, cinder block homes, and chickens running around. We also got a pretty good dose of what the area was like when we spent a night in Stone Town. We stayed at the Zenji Hotel, which was nice, and the food at the café was delicious. But the spice market, that was something else. Way back in the day when trade routes were being established in Europe, the spice market in Zanzibar was where all the action happened. And let me tell you, it was still a happening place. I don’t think I’ve seen any other markets with so many people milling about, pushing their way through fruit vendors, and clothes vendors, and meat vendors with flies landing on rows of meat, weaving through a maze of covered tables while everyone is calling at you to look at what they have to offer and that they love Obama. It was like running through a gauntlet; trying to take pictures without being a flashy tourist, hoping to not get suckered in while also keeping an eye out for something I might actually want, bartering for a reasonable price while keeping in mind the extra dollar probably means more to them than it does to us. It was crazy and once we made it out of there in tact, we were so glad we experienced it. So I feel like Batman, but, “stay tuned for our next adventure. Same bat time. Same bat channel.” This one will be Ethiopia, where even people who love Addis will tell you it is crazy. Anyone else traveled recently or have trips coming up? Do you know that I’m a crazy- travel-planner so probably have an itinerary of where you should eat that you can probably sort by location or price? While Cape Town was amazing, and I would have been happy to spend the rest of the week there, we had a lot more traveling to do. Next up was our safari! I think for about five months straight I had the Toto song "Africa" in my head because I thought about it every time I did any planning. Let me just tell you, if you start looking into safaris, the sheer number of options is quite overwhelming. I kid you not, I watched all the safari documentary videos I could find on Netflix in hopes of making a more informed decision. I mean, there are good options all over the entire continent of Africa, though we narrowed our choices to the Kruger Park area of South Africa and the Serengeti in Tanzania, mostly because we were spending time in those countries already. Plus, there are dozens of tour operators who can coordinate everything for you, but also charge a good bit to do so. I think if we had been traveling during the great migration of the Serengeti (Sept-Nov I think) then that would have been a better option, since the big open plains are really what most people picture when they think of safari. However, Tanzania was also more expensive and seemed harder for us to get around on our own, so since we weren't going to be seeing the migration anyways, we chose to go to Mala Mala. We'd heard from a friend that since it is a private game reserve, you could see a lot of animals in short amounts of time without too many other people around, which sounded perfect. We've had good luck finding lower rates for our honeymoon though Latin Destinations and were able to do so again in Africa on (you guessed it) Southern Destinations, though I'm not actually sure if the companies are affiliated. We took the one hour flight from Cape Town to Johannesburg, where we picked up the rental car for what I thought would be about a 5 hour drive. Turns out things are a little tricky when you hit construction, don't have a GPS, and also read the directions a little bit wrong. Try 8 hours. For the last 2 hours of the drive I kept thinking we were only 20 minutes away, which was not the case. Mala Mala is a private game reserve in what is known as the Sabi Sands, which is right next to Kruger National Park. Our tiny compact rental car got great mileage for the first 6 hours, but was definitely not the right choice for hilly dirt roads in the wilderness, some of which were entirely covered in puddles of water. We entered the main gate as the sun started to set, which was a relief, but we still had about an hour on dirt roads in the middle of nowhere with no cell phone signal in the dark. Jason (or shall we say "Steve Erwin"?) had a great time holding the flashlight outside of the window in search of wild animals, while I did my best to mentally will us not to get a flat tire, stuck in the mud, or attacked by a herd of wild animals. God answered my prayers, and we made it to the lodge just in time for dinner. Our guide, Gary, greeted us: "We were literally just about to send out a search party for you." At least we didn't miss dinner. Good thing too, because everything was delicious. There was usually a buffet with appetizers, salads, some sort of game, vegetarian options, desserts, cheeses and coffee and tea to top it all off. The next couple days went like this: meet at 6 am for a game drive, come back for breakfast, nap, have lunch, hit up the pool, meet for our evening game drive, dinner then bed. It felt like we were eating or sleeping all the time there. Not that I'm complaining. Our games drives were amazing, and our guide so kind and knowledgeable. Gary drove us and one other couple the whole time, which was lots of fun. The landscape was very brush-y: lots of trees and shrubs with roads in between them all. We saw most of the animals you could think of in just the two days we had: leopards, an entire pride of lions, elephants, rhino, hippos, a giraffe, wildebeest, cape buffalo, zebra, and all sorts of antelope and birds. And we were really close to them all. Just check out the picture with the leopard and notice how close the car in the background is. The second day it started raining, which wasn't a big deal, except that I kept thinking of how awful our drive out of there would be, considering how hard it was just to get in. Well, it kept raining, and eventually the camp confirmed that they were evacuating everyone, and since our car would never make it on the washed out roads, they would arrange a transport back to Johannesburg. The downside of DIY-vacation-planning is that there is no travel agent to contact the airline, hotel and rental car company for you, but what's a few hours of stressful last-minute rearranging plans? Even though we had to leave a day early, Jason and I still felt like in two days we got the full safari experience and were not disappointed at all in what we got to see. Guess all my Netflix "research" paid off.